Mova rotating globes are simply some of the most technologically advanced and aesthetically pleasing globes on the market today. Bringing together superior technology and simple yet stunning design for world globes that are completely unique and one of a kind. All Mova globes use the power of ambient light in conjunction with a layer of safe fluid in between two of the globe's layers to give the sphere a natural rotation that simulates the very rotation of our Earth, and require absolutely no power source to operate (no batteries or power cords)! 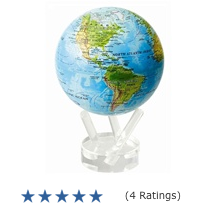 Mova Globes are smaller than traditional desktop globes, making them an ideal fit for small spaces such as a tight workstation, a bookshelf or a small table. They're available in a variety of different colors and stand styles that will complement almost any home or office décor, whether the surroundings have an antique, rustic feel to them or a sleek, contemporary and stylish appearance. There's nothing more fascinating and intriguing than the way Mova Globes' spheres rotate! They make an excellent conversation piece and despite their smaller size, they'll become the center of attention no matter where you put them. You'll love the way Mova Globes' helps you to learn more about the world we live in with the most accurate and up to date cartography available, paired with expertly designed aesthetic qualities that fit in any home or office setting. Check out the full selection of Mova Globes today! Great information! I love these mova globes. They're super cool and I love how they can spin on their own. It even spins when I hold it in my hand!